^ Alaska Department of Labor & Workforce Development. (2006). "Table 1.8 Alaska Native American Population Alone By Age And Male/Female, July 1, 2006. "[ permanent dead link] Alaska Department of Labor & Workforce Development, Research & Analysis. Retrieved on 2007-05-23. ^ a b c d e f g h i Lightfoot, Ken G (2003). "Russian Colonization: The Implications of Mercantile Colonial Practices in the North Pacific". Historical Archaeology. 37 (4): 14–28. doi: 10.1007/BF03376620. JSTOR 25617092. ^ a b c d Reedy-Maschen, Katherine (Fall 2018). "Where Did All the Aleut Men Go? Aleut Men Attrition and Related Patterns in Aleutian Historical Demography and Social Organization". Human Biology. 82 (5/6): 583–611. doi: 10.3378/027.082.0506. JSTOR 41466705. PMID 21417885. ^ a b Veltre, Douglas, W (Fall 2018). "Russian Exploitation of Aleuts and Fur Seals: The Archaeology of Eighteenth Century and Early Nineteenth Century Settlements in the Pribilof Island, Alaska". Historial Archaeology. 36 (3): 8–17. doi: 10.1007/BF03374356. JSTOR 25617008. Chythlook-Sifsof, Callan J. " 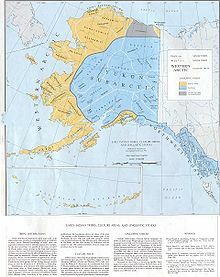 Native Alaska, Under Threat." (Op-Ed) The New York Times. June 27, 2013.